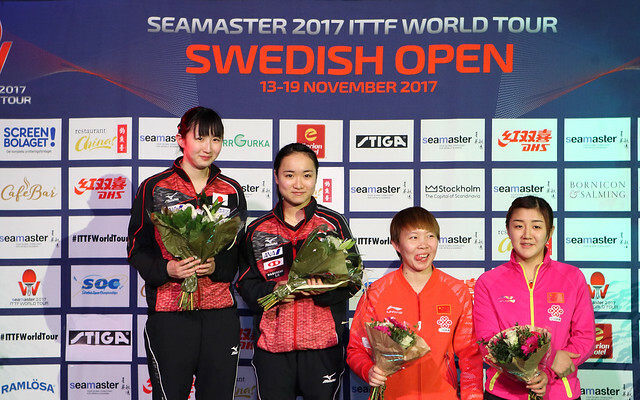 Success had followed success for China in the opening round of the Women's Singles event at the Seamaster 2017 ITTF World Tour Swedish Open, as the opening day of play, Thursday 16th November, commenced in Stockholm. Moreover, the success had been contrary to status. Required to compete in the qualification tournament, Chen Ke, Zhang Qiang, Sun Mingyang, Gu Yuting and Li Xiaodan had all beaten seeded opposition to book second round places. The prevalence in the corresponding round of the Men’s Singles event was not that great but it was present in the guise of Liu Dingshuo and Zhou You. Right handed Liu Dingshuo, with a liking for France, being crowned World Junior champion in 2015 in La Roche-sur-Yon, faced the left handed Emmanuel Lebesson, the no.15 seed, the latest Frenchman in the Jean-Philippe Gatien style of play with the quick-fire forehand. Liu Dingshuo held the aces to emerge successful but in the fifth game as the winning post loomed. He did appear a little tense, he took a “Time Out” at 10-9, only for the Frenchman to level before eventually securing the contest, after holding one more match point at 11-10; the celebration was one of joy mingled with relief (11-7, 12-10, 11-7, 3-11, 13-11). A hard fought success for Liu Dingshuo, it was even harder for Zhou Yu; he needed the full seven games to beat Chinese Taipei’s Chuang Chih-Yuan, the no.8 seed (11-9, 9-11, 5-11, 12-10, 10-11, 13-11, 11-6). In the corresponding match as proceedings advanced there was more success for China but as anticipated. Yan An, the no.10 seed, beat Japan’s Masataka Morizono (11-8, 11-6, 11-9, 11-7); Lin Gaoyuan, the no.4 seed, ended the hopes of Japan’s Maharu Yoshimura (13-11. 13-11, 11-2, 11-6). In the second round Zhou Yu meets Yan An, Liu Dingshuo opposes Lin Gaoyuan; the matches will be played on Friday 17th November.